Anyone who is considering Chapter 7 bankruptcy protection to free themselves of the often wonders if their debt is large enough to qualify them for the protection they seek. While a minimum qualifying debt has not been established for a consumer to qualify for Chapter 7 bankruptcy protection, there are other prerequisites that must be met. If a consumer is being threatened with lawsuits, wage garnishments, repossessions, or aggressive threats from creditors, Chapter 7 bankruptcy may offer the best way to recover from financial difficulties. The beginning process for filing starts with meeting a bankruptcy lawyer. In many cases, a no obligation, a free consultation is used to explore the facts of the individual’s case with the lawyer. However, bankruptcy is not an option for everyone. Filing for Chapter 7 bankruptcy protection is a debt relief option for consumers regardless of how much or how little debt they may have. However, other prerequisites must be met in the filing process. • Debts Eligible for Discharge: Not all types of debt can be discharged through Chapter 7 bankruptcy. Most unsecured debts are eligible for discharge (including credit card debts, payday loans, and medical bills). However, often times, student loan debts and certain tax debts are not subject to discharge. Other debts such as mortgage and car loans may be discharged, but often times, the debtors choose to reaffirm on the debts (and keeping their home or car), a consideration that can be discussed with their counsel. • Income Requirements: Consumers debtors must pass the Chapter 7 Means Test to be able to file Chapter 7 bankruptcy, and it is a way to ensure that only those consumers without the ability to make meaningful debt repayment amounts can file. This determination involves a calculation of household income compared with the debtor’s family size and other requirements. • Multiple Bankruptcy Filings: If the debtor has previously filed for bankruptcy, he will only be eligible to file for Chapter 7 if a specific period has passed following the previous discharge. The filing deadlines can be discussed with their counsel. If one or more of these requirements prevent a debtor from filing Chapter 7 bankruptcy, a Chapter 13 bankruptcy may be an option. A Chapter 13 protects the debtor and a payment plan will be established to deal with the debt concerns. 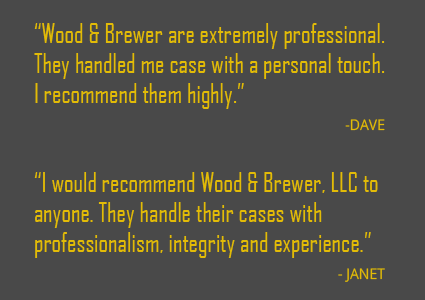 No matter what type of bankruptcy option you choose to pursue, the attorneys at Wood & Brewer, LLC are here to help. We understand that financial concerns can be very stressful. That is why we offer a FREE consultation to see what option is best for you to regain control of your finances. We welcome you to contact us today! YOUR LIFE. YOUR CASE. OUR PRIORITY.